Made with a lightweight and rigid aluminum box frame construction, the Speedmetal Front Aluminum Pro Race Stand is inspired by the MotoGP and World Superbike paddocks. The powder coated matte finish and oversized wheels are designed for long life and ease of use. Finally a proper/good front stand for my bike. Fit and finish are awesome. I've been owning it for less than 15 minutes, but I already love this thing!!! Does what it designed to do excellently! I'll update this review if anything changes. 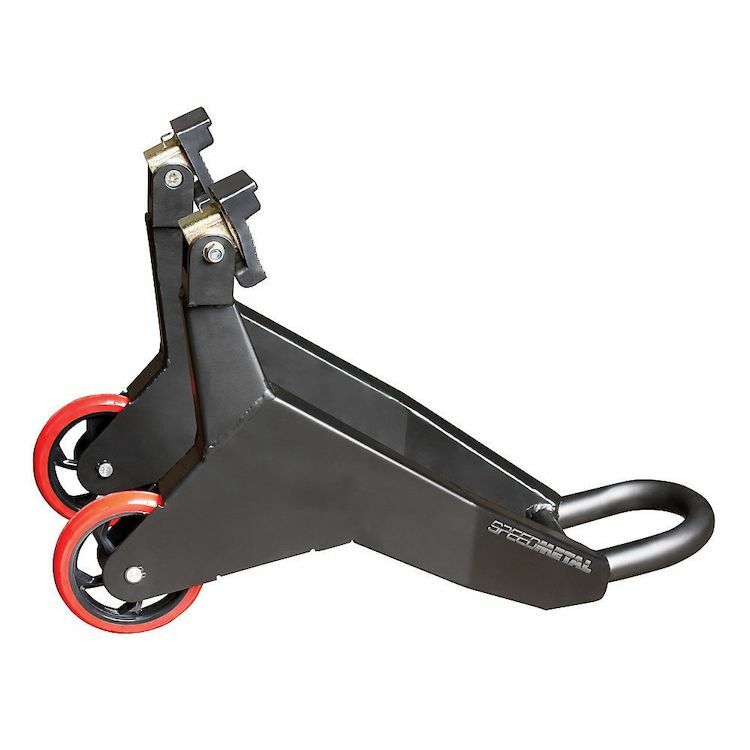 Very easy to use and helps working on the front wheel a snap. I have both the front and rear stands, and I couldn't be happier! These are the only stands I have ever used, but after using them I don't see what all of these other expensive brands have to offer that you can't get done with these cheaper options. The front stand even fits between the rear stand to take up less space. I bought this stand while it was on sale here at revzilla. While it was well worth the sale price, I wouldn't say it would be worth the full price. the biggest downsides to this stand is the look of the welds and the short pivot point. the welds are strictly cosmetic and don't change the function in any way, but the short handle makes it somewhat difficult to lift the bike. This being said, It is perfect for what i needed. I work in a garage with limited space so the short handle and overall small size of this stand really help. Also, the fact that it is a solid construct make it extremely simple to use and means you won't ever have to come back to readjust or tighten any bolts like on many other stands. Works very well on my S1000RR. Seems price jumped up a little from when I bought it, it was 79.99 so I definitley saved some cash. Would it fit my Suzuki Gsxs 750,front tire?? BEST ANSWER: I use it with a yamaha r1 and also with a kawasaki zx6 with no problems at all. I believe you won’t have problems with your Suzuki 750. If the ends of your front forks are flat, i don’t see why it wouldn’t. I used this on an 07’ bike with Showa forks. It supports the bottoms of the fork tubes. Plenty space for a tire. Fit my GSX1300R no problem. Can I change a front wheel while using this? BEST ANSWER: Yes. I have done it on my Aprilia. Loosen all the required bolts and axle nut before putting the bike up on it. Yes, you can. However, make sure you are also using the rear stand. Yes, that’s what it is for. By any chance would this fit a 06 zx14? BEST ANSWER: It'll fit pretty much any bike with spools. Work for a cbr 954? will this fit my 2001 Sv650s?